Koops is a shy Koopa Troopa from Petalburg, and the second partner to join Mario's party in the game Paper Mario: The Thousand-Year Door, after Goombella. His left eyelid is half-closed, and he wears a bandage on his nose, a light-blue hoodie, blue pants, and white shoes. Very much like Kooper from the original Paper Mario, Koops can retreat into his shell and use it as a weapon against foes, and Mario can also launch him at switches or distant objects to hit them or retrieve them. However, he differs from Kooper in that Mario can hold Koops's shell in place. He has a girlfriend named Koopie Koo and a father named Koopley. His name is a portmanteau of "Koopa" and "oops", an exclamation of clumsiness (Koops being clumsy); it is also a real surname. Koops stops Mario, but his shyness overcomes him. Koops first meets Mario in Petalburg. He doesn't say much, but before Mario leaves to another part of town, he stops him, then his shyness overcomes him and he goes back. When Mario goes off to Hooktail Castle, he stops him again and is firm that he wants to join Mario's party in order to avenge his 'dead' father, but not before Koopie Koo finds out. She begs him not to go, but he says he has to be a strong Koopa for her. She gets mad, withdraws into her shell, and fires herself at Mario and Koops. Koops mistakes Kolorado's father for his. 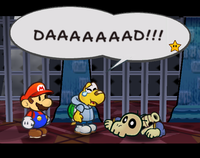 Inside the castle, Koops finds a skeleton that he believes is his father's. Reading the note the corpse was grasping reveals it was actually Kolorado's father. Koops blushes and is slightly embarrassed, but then wonders if any of the other skeletons is his father. When Mario and Koops first meet up with Hooktail, the dragon remarks that they look similar to one that passed by here recently. The battle then starts. Once the fight is finished, a near-dead Hooktail spits up Koopley, who was living in Hooktail's stomach for ten years. 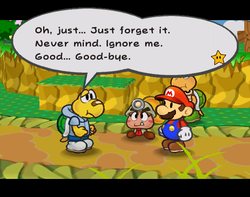 After a touching reunion, Koopley reveals he found the Diamond Star in Hooktail's stomach, and allows Mario to take it. After assisting Mario in his quest to collect the rest of the Crystal Stars and save Princess Peach, Koops returns to Petalburg where he makes plans to marry Koopie Koo and run for mayor. Koops is the only partner with a defense of 1. However, he has the lowest HP of all partners, having 15 HP when at Super Rank. Furthermore, if enemies jumps on him and he isn't able to defend himself using an Action Command, he gets flipped over and cannot move while also losing a defense point. "That's Koops, from Petalburg. He's got confidence issues... He's a... cringer, y'know? But he's definitely got a serious interest in Hooktail... I wonder why?" "That's Koops, from Petalburg. He's been waiting here, hoping to join you. He's a bit green, but braver than I thought... I'll have to rethink my first impression. I mean, he seems totally earnest, know what I mean? We should take him along." In Super Paper Mario, Koops appears as a Catch Card won by winning the Duel of 100 in the Sammer's Kingdom. Koops could also be seen very briefly during the intro, where he and all the other partners from the previous Paper Mario titles could be seen in a photograph at the Mario Bros.' House. Card Description: It's Koops from the last Paper Mario adventure. Kicking some shell never felt so good. Nokotarō Portmanteau of Nokonoko (ノコノコ), the Japanese name for Koopa Troopa, and the Japanese male name Tarō (太郎). German Koopio Probably a portmanteau of "Koopa" and "Coolio". Italian Koopaldo Portmanteau of "Koopa" and the Italian male name Aldo. Koops is inconsistently depicted with either three or four fingers on each hand. Koops is the only party member in Paper Mario: The Thousand Year Door to have a defense point without equipping a badge or using Power Lift or an item. The Italian version of the game states that the pale yellow color of his skin is because he has an unknown sickness. Koops's Japanese name, ノコタロウ Nokotarō, is used as one of the wrong answers in one of Chuck Quizmo's questions in the Japanese version of Paper Mario. This page was last edited on October 1, 2018, at 22:18.